The new sports car from Toyota has been spotted once again. 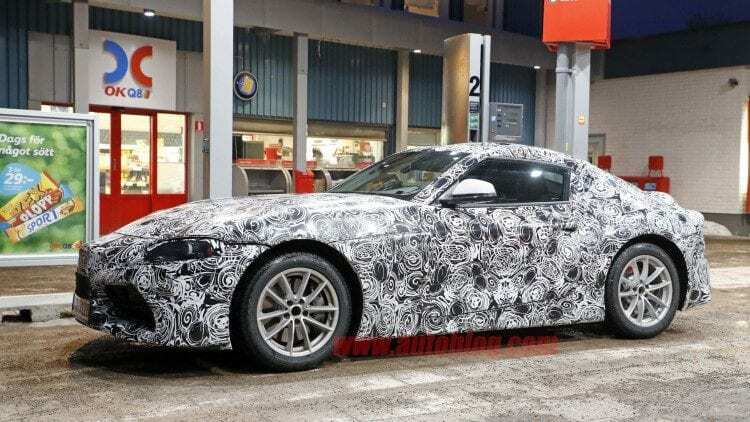 It is obvious now that the automaker plans to incorporate some of the design features from the FT-1 concept into the Supra which was now seen standing still in front of a gas station. Photographers took advantage of this amazing opportunity to snap a few close-up photographs of the vehicle. These photos are the first time we get to see model’s front which features massive air vents and a protruding nose. It is possible that underneath the mask, the Supra has the same beak that the FT-1 concept sports. Toyota has done a great job of masking and hiding the headlights, so their shape remains a mystery for now. At the rear end, these images seem to show the shape of the car’s double bubble roof and rear window. It also appears that the ducktail spoiler is not as big as it was on some of the previous shots. The BMW Z5 and the Toyota Supra will be underpinned by the same platform and will have RWD, although the German model might be going with an entirely different design. Magna Steyr facility in Graz, Austria will be in charge of manufacturing both vehicles. We still do not know what will be under the hood of 2018 Toyota Supra. It might feature the company’s new twin-turbo V6 or turbocharged four- and six-cylinders from BMW. Sometime after the regular Supra, a hybrid is also expected to come out.